Vote YES on Prop C for Affordable Housing! 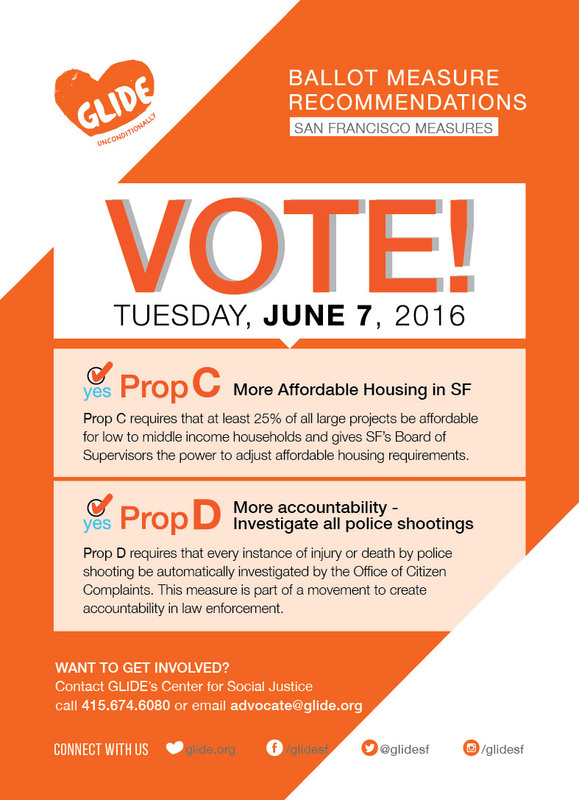 On June 7, bring a friend, or two or three, to vote YES on Prop C for affordable housing! If passed, Proposition C would allow San Francisco’s Board of Supervisors to change affordable housing requirements for new housing projects, initially by doubling the current on-site affordable housing requirement from 12 to 25 percent. This would result in hundreds of new affordable units for low- and middle-income residents of San Francisco. According to Prop C, 15 percent of new rental units would be allocated for individuals earning about $39,000 or less and for families with a collective income of about $55,000. An additional 10 percent would go to those making up to the average income for San Francisco (about $70,000 for individuals and $100,000 for families). If passed, Prop C will provide housing for people at almost all income levels while reducing the pressure on San Franciscans who must too often compete for the very few affordable units throughout the City. We need to make a BIG showing at the polls to prove that San Francisco is starving for measures that increase affordability all of our residents. Because Prop C allows the Board of Supervisors to change the conditions and definitions of affordable housing in the future, we need to emphatically support a mandate that the encouragingly high percentage levels for affordable housing are established and indeed built upon. Vote YES on Prop D for Police Oversight! Bring those same friends and vote YES on Prop D for police oversight! Proposition D requires the Office of Citizen Complaints (OCC) to investigate each instance of a San Francisco police officer killing or physically injuring someone with a firearm. Right now the public has little oversight, piecing together information with smartphone videos and security camera footage. In the past five years, only eight of San Francisco’s 31 police shootings have been investigated. This is because the OCC has been hamstrung into only responding once a citizen has filed a formal complaint with the Office. Formal complaints are rare because many San Franciscans are unaware of the OCC and also feel disempowered to seek justice, especially those who have been victimized by police violence. Let’s support our neighbors and the police that serve them by thoroughly investigating, analyzing and establishing clear-cut conclusions in every instance when someone is killed in a police intervention ostensibly meant to protect our community. GLIDE’s Social Justice Center promotes the participation of all people in the decisions and resources that affect, bolster—and sometimes harm—our society. Through community learning, mobilization and attending to the lives of our poorest and most disenfranchised citizens, all of GLIDE’s programs promote a just and loving way of living together.